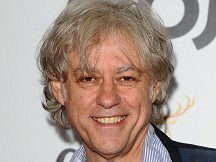 Bob Geldof says he finally understands what life's all about - love. The singer and campaigner, who was married to the late Paula Yates, has been in a long relationship with French actress girlfriend Jeanne Marine. He said: "At 19, I didn't understand that without the existence of love, the human condition is painfully absurd and futile. "I think that's understood by most people, but I'd never got it 'til recently, how critical it is to be in love and to be loved." The singer, who has released a new album, How To Compose Popular Songs That Will Sell, said: "Writing the song To Live In Love for the new album was a blinding revelation to me, 40 years too late, of course. "It surprises me as I race to 60, that things are OK. Who would've expected that? Bob begins a UK tour in September 2011. Stars including Elvis Presley, Michael Jackson and Madonna all failed to get a single song in a top 100 Desert Island Discs playlist chosen by listeners to the show. Emma Bunton has promised the forthcoming musical inspired by the Spice Girls' songs will be "amazing" but said she had been sworn to secrecy about the story. US country music star Trace Adkins says he won't be as nervous this time when he hosts the second American Country Awards alongside Kirstin Chenoweth. Michelle Williams' new film My Week With Marilyn is tipped to receive its world premiere at the New York Film Festival. Joe Jonas' Fantasy has become reality, after he announced that he will be supporting Britney Spears on tour. Platinum-selling pop star Lady Gaga will sit down with fashion designer Jean Paul Gaultier for an interview special airing next month. Rapper Lil Wayne is facing a 15 million dollar (£9 million) legal battle over allegations that he stole the hit song Bedrock.